Venison’s lean, peppery character, says Blackberry Farm proprietor Sam Beall, is beautifully complemented by a Syrah. “We particularly like the Syrahs from a town in the northern Rhone called Côte Rôtie,” says Beall. “This region is a colder region for Syrah and produces more elegant and floral wine with a hint of black pepper that makes a fine counterpoint—and echo—for the venison.” We’re not arguing. 1. In a medium saucepan, combine the apple cider, orange zest, and cinnamon stick and bring to a boil. Reduce the heat to medium and simmer, uncovered, until the mixture is slightly syrupy and has reduced to about 1/3 cup, 25 minutes or so. Remove from the heat, discard the cinnamon and zest, and set aside. 2. Season the venison steaks on both sides with salt and pepper. In a medium skillet, heat the oil over medium-high heat. When the oil is hot but not smoking, add the venison steaks and cook, without turning, until nicely browned, about 2 minutes. Turn and repeat on the other side. 3. Leave the venison in the skillet and carefully add the butter and half of the cider reduction to the skillet. Continue to cook the venison, spooning the pan juices over the steaks every minute or so and turning the steaks once, for about 5 minutes more, until an instant-read thermometer inserted into the center of a steak registers 130°F (57 °C). Alternatively, if you pierce one steak (yours!) with the tip of a paring knife, it should appear medium-rare, meaning it will be vibrant red, but not raw, at the center. 4. Transfer the venison steaks to a cutting board and let rest for 5 minutes. Meanwhile, reduce the pan juices slightly until syrupy and of proper drizzling consistency. If you care to show off the bright red centers of the steaks, slice each steak the long way. Place the steaks on plates and drizzle with the reduced pan juices and the remaining cider reduction. Cider-Basted Venison Recipe © 2009 Sam Beall. Photo © 2009 beall + thomas. All rights reserved. 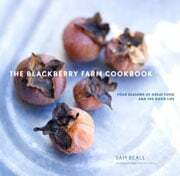 All recipes and photos used with permission of the publisher. 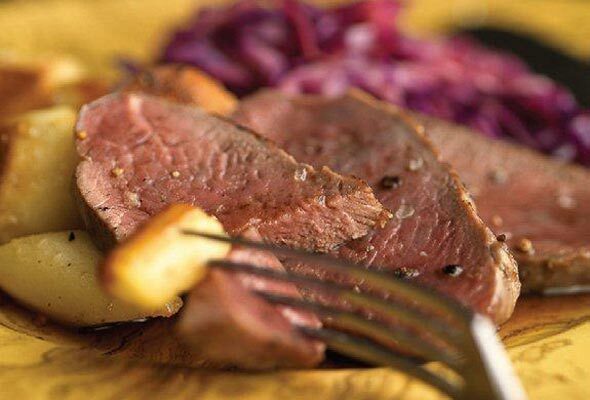 This cider-basted venison is fairly simple to prepare, yet it’s one of the best venison recipes I’ve tried. It took about 15 minutes longer than the required 25 minutes for the cider to reduce, but pan size could account for that. Keep in mind that the pan juices will thin the reduction somewhat as well. Although the pan glazing works well, you could also get away with grilling the steaks, then serving the cider reduction at the table. The recommendation of a nice Syrah is perfect as an accompaniment. There was nothing to dislike about this recipe. The cider reduction coated and complemented the venison beautifully, and the cooking times produce a wonderfully rare piece of meat. I finished it in the pan, basting every minute, and turning the steaks halfway through to cook them evenly, yielding great results. It’s an absolute winner. This is a great way to use venison that I hadn’t seen before! Some people may complain that venison is gamey, but this dish provides a hint of sweetness that pairs well with this “gamey” meat. Make sure you cook the reduction until it’s slightly syrupy; this will coat the loins beautifully. I served this with homemade rice pilaf and green beans from the garden. It made for a beautiful fall meal that wasn’t too challenging. This recipe takes some time, but is worth it!